I write to you with my foot on top a bag of frozen peas. I had my first podiatrist appointment yesterday, and I have received an official diagnosis. 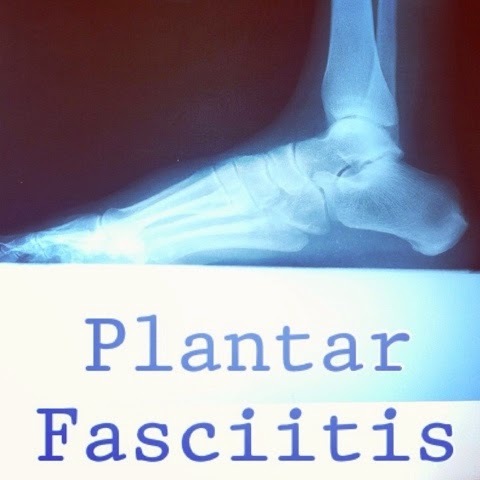 Plantar Fasciitis with the start of a bone spur. Even though my podiatrist was the one who gave me the bad news, I still really like the guy. He took me seriously when I told him I'm a runner. For some reason, I still pause for reaction when I tell somebody new that I am a runner. It might have something to do with the fact that I am overweight and don't look like a runner. He believed me anyway, so I instantly like him. I added the words for dramatic effect. Or maybe I added the words to make it look more like an award. I haven't quite decided yet. Is it weird that I am kind of excited to have my first running injury? It's like a battle scar, almost. The pain stinks, of course, but I feel like I'm finally "in the club". The runners club. More like the running injury club. Yeah, that's what it is. So, it turns out plantar fasciitis is going to be a pain in my foot for the next few weeks. I have a lot of work to do in order to heal. Running, unfortunately, is not one of them. Is it weird that I felt a twinge in my stomach and a tear in my eye when the doctor said "no running for two weeks"? I have gone two weeks without running before, but this is different. It's kind of like that feeling you get when somebody tells you that you can't eat chocolate for two weeks. What do you think you'll be craving, then? Chocolate. I have to call today to schedule my follow-up appointment. I've got about three weeks of icing and stretching ahead of me. I'm planning on sticking to the doctors orders so that I will be healed just in time for some outside running and (fingers crossed) warmer weather. Sorry you have your first running injury. Good luck with your physical therapy. You'll be back on the asphalt in no time!